Results from this 20-patient prospective study demonstrate safety and feasibility of mechanical thrombectomy for emergent large vessel occlusion with mild symptoms. Support for endovascular therapy for emergent large vessel occlusion (ELVO) in the setting of mild acute ischemic stroke is mounting, according to results of the prospective MISTWAVE study being presented this week by Cleveland Clinic researchers. Dr. Toth detailed the rationale for the MISTWAVE trial in a July 2018 Consult QD post when he presented findings from its first three patients at the annual meeting of the Society of Neurointerventional Surgery. Since that time, the Cleveland Clinic-led investigation has added a second study site — the University of Iowa — and accrued outcomes on 20 patients for presentation at ISC 2019. MISTWAVE (Mild Acute Ischemic STroke With LArge VEssel Occlusion) is a single-arm prospective study of patients with anterior circulation or basilar artery ELVO within 24 hours of onset and an initial National Institutes of Health Stroke Scale (NIHSS) score < 6. Exclusion criteria were prior intracranial hemorrhage, current anticoagulant use or an Alberta Stroke Program Early CT Score ≤ 6. Patients received best medical therapy combined with endovascular mechanical thrombectomy using FDA-approved devices. Enrollees may or may not have received tissue plasminogen activator (t-PA) therapy. The primary safety end points were symptomatic cerebral hemorrhage (ECASS III definition) within 24 hours of the procedure and worsening of NIHSS score by 4 or more points within 72 hours of intervention or during hospitalization. The researchers also recorded clinical and radiographic outcomes. The 20 enrollees (11 men, 9 women) had a mean age of 65.6 years. Twelve had M1 occlusions; eight had M2 occlusions. TICI grade 2B or 3 recanalization was achieved in 19 of 20 patients (95 percent). No patients suffered symptomatic cerebral hemorrhage. One patient experienced neurological worsening within 24 hours in spite of TICI 3 recanalization; this was due to an underlying intracranial stenosis. No other periprocedural complications were observed. Median NIHSS score declined from 3 at presentation to 0 at last follow-up. Eighty-five percent of patients (17/20) were discharged home with minimal or no residual deficits. Excellent clinical outcome, defined as a modified Rankin Scale score of 0 or 1, was achieved in 19 of 20 patients (95 percent). The neurosciences field is changing rapidly, and so are all of our practices. Clinicians and researchers from Cleveland Clinic’s Neurological Institute discuss the latest advances in patient care, research, and technology — specifically for healthcare professionals. 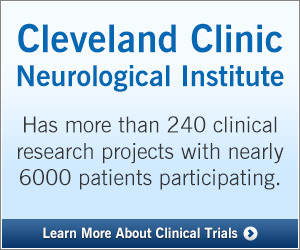 Get the latest news and research from Cleveland Clinic’s Neurological Institute.